So I have this bathroom in my new house. That's a good start, right? All houses should have a bathroom, I think. Call me crazy! Anyway, despite what I have rather dramatically suggested above, this bathroom isn't quite the bathroom of doom, but it sure ain't particularly pretty either. It's very small, for a start. It is, on the upside, very tall---thanks to a skylight, although when we moved in the skylight had these weird streaks of brown on it (bird poo? God, let's hope so) and now we can't figure out how to clean it---but in terms of room for maneuvering, there's pretty much just enough space for a bath, a loo, and a sink. And I mean just. That's not the issue, though. The issue is.....well, the issue is beige. The lovely white cast iron tub has been painted beige. The weird speckled tile that surrounds every inch of wall space is beige and a slightly darker beige, with---I swear to god---beige-colored grout in between. The floor is beige. The sink, toilet, and walls are all white, which is a nice reprieve, but all the fixtures (the towel rail, the toilet paper holder, the hand towel hoop, and so on) are also beige. And I'm not talking a good beige, like a calm wheat or a neutral khaki or something. I mean, like, putty-colored beige. I don't think anything in your home should be capable of being described as "putty" but maybe that's just me. Oh, me and my wacky ideas. Yeah, even worse than you were thinking, right? So here's the thing: what am I supposed to do with it? And how can I do it quickly and cheaply? My ideas, thus far, are to invest in a white waffle-weave shower curtain for the tub---thus covering both the weird beige paint job and a good 60% of the speckled tile---and maybe also.....nah, actually that's it. Those are all my ideas. I'm out. I mean, eventually, we want to rip out the speckled tile and put in lovely clean white subway tile for a backsplash, get the tub painted back to white---is that a thing? Can you do that? Do you just find a tub painter on Yelp or something?---and lay some black and white vintagey-looking tile on the floor, but with 34873897 home improvement projects lined up in front of us at first (like, get blinds being one of them; I'm tired of flashing the neighbors), these things will just have to wait. So any ideas for what can I do in the meantime? Apart from close my eyes every time I'm in there, I mean? The nice shower curtain will help a lot with hiding grossness/providing a nice backdrop. You should be able to replace the tp holder, towel bar, etc fairly easily/cheaply from Lowe's, Target, wherever with something NOT BEIGE. Get some pretty pictures and towels in there, and hang in there until you can really re-vamp the place! I'm also 99% sure you can re-finish a bathtub but no idea if that's a DIY-type thing or something you hire a professional to do? Tubs can be refinished - my understanding is it's definitely something you want to let a professional handle. Otherwise, I 2nd the cheap accessories from Lowes or Target. You can refinish a bathtub, but I don't think it is a DIY job, I think you have to hire a professional. My parents inherited my grandmother's home and along with it her pink and green bathroom, complete with mint green bathtub and tub enclosure. They were able to get that updated to a lovely white, and I think it was even done in a day. In the meantime I would be covering that craziness up with a new shower curtain and bath mat ASAP, but maybe that is just because I love an excuse to go to Target! Oh, I know that beige. It's the one they use in junior highs and prisons. I'm not sure what to suggest, except maybe a dose of Zoloft before going in? Erin, it is THAT SHADE PRECISELY. Drab Institution Beige, I believe the paint chip reads. Catchy! Spray paint is your friend. You can spray the towel bar, toilet-paper holder, etc. without having to invest in new ones until you are really and truly ready to re-vamp. Also, as other commenters have mentioned, getting your tub reconditioned is not a job you want to take on yourself. We gutted our bath and redid everything but this job ourselves. I think, also there is something called grout paint. I don't know how much tile you have, but you can paint this stuff on the grout to make it white. I used it to cover icky spots that would never come clean when we were selling our house. Good luck and welcome to the wonderful world of home ownership and it's orbiting moon--home improvement. I've never commented before, but I feel like I MUST chime in. We had a lovely old tub that was also an unfortunate color and we had it refinished for $250 (by a professional) and it looks straight off the factory floor. Absolutely gorgeous. Prior to calling in the professionals, I tried a DIY tub painting (LIKE NEW! the box said, pshhhht) product that I was sure had ruined the tub altogether. 3rd the easy change to the towel bars, etc. And the waffle-weave curtain. Add some nice aqua towels, and find some coordinating art with teal and 'beige' from TJMaxx/Marshalls/Ross to bring it all together. Can we see a picture of the prison-like-bathroom-of-doom? Suzrocks, good point. I'll take one and add it! I'd recommend paint and BIG towels. We had a bathroom that was brown and pink: brown like people-poo, and pink like poo-from-people-who-have-eaten-beets. It was lovely. But because the bathroom was small, we were able to cover most of it with the shower curtain and towels. We had the (brown! shudder!) toilet replaced, since that was relatively cheap, and we switched out the towel and toilet paper holders to brushed nickle. We also painted the walls to match the towels and shower curtain, and it turned out looking not-so-bad. I mean, not anything you'd see in a magazine, but it no longer made us want to tear out our eyeballs while we were peeing. I'd try some other color somewhere in there than just white and beige - I feel like a white shower curtain might just enhance the two-tone color scheme, especially if you repaint the fixtures white. Maybe include some pretty pictures with mahogany colored frames, and get a shower curtain that's a crisp, pale green or blue or something? Oh yes, the disgusting bathroom color! For me it was avocado green. 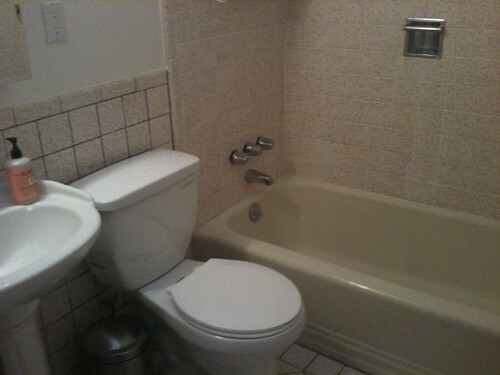 The tub, toilet, and sink. I lived with it for ten years before we ripped it all out and boy howdy was it wonderful! If you have the means, definitely paint the bathtub. I'm not sure what your budget is but for a small space re-doing the tile might not be that expensive. You can hire someone to do an epoxy glaze on your tub & tile. They can do it in a day, it's not too expensive and it will completely change the look of your tile. My husband is a contractor and here on the east coast, it would run about $600 to do the tub & the tile. Trust me, will make it look brand new without having to rip anything out! In the meantime, I like the idea of the white waffle weave shower curtain, maybe a big fun rug to cover the ugly floor tile and spray paint the fixtures. Add some art and maybe an interesting light fixture and you're done! Good luck! Can't wait to see photos. You could cry? That's what I do with all my home decorating woes. Sure, add some crisp white, which will pop against the subdued beige, but I acree with some of the other comments -- add a spot of color here and there. Aqua! Or mossy green! Or even red (but that's not as relaxing)! If you stick with just beige and white, I think it will still be too bland. There is this very cool thing I have seen done here in NM with sky lights. They paint the interior walls of the skylight up to the light itself a different color (like yellow, or blue) and it does amazing things to the light that floods through. But the sun is extremely intense here, so I don't know if you'd get the same effect. It's worth a shot and might subdue the intense beigeness of the room. If you're ultimately going to rip the tile out, you might want to consider DIY tile paint for the shower recess, at least. It does sound a bit time-consuming (2 coats primer plus sanding in between according to eHow) but could be worth it. While the shower curtain will shut off the beige-icality to the passing parade, can you live with it as you shower EVERY DAY? Remember, it's YOUR bathroom. Plus: add a plant, something that will distract the eye and make you think you're in a sandstone cave. You could hang it from the ceiling near the skylight, perhaps. I like the idea of the shower curtain you mentioned. And, of course, you could always accent with your most favorite color- turqoise. Just little pops of it here and there. Turquoise makes EVERYTHING look better! Yes. Assuming the tub is porcelain cast, it can be re-coated. This is a professional project, but not an expensive one and it will make your tub like new. AND THIS IS WHY I STILL DON'T OWN A HOUSE. I do not know the answer to these questions. Painting what little wall space you have a nice bright color would do a lot to liven the place up! That and replace the mirror with a great funky framed mirror, like from Target or something. Also, if you are not already addicted to it, you should check out the website Young House Love. Check out the House Tour section. Their bathroom redo was amazing! And cheap! Put up that shower curtain (target sells that waffle weave one) and you will suddenly care less about what it behind it. Trust me I have been doing that for 6 years. Then a bit of paint on the walls. Turquoise would be nice. Then live with it a bit until you figure out what you want to do. Wow I had no idea there were so many different shades of crappy beige. That's quite impressive, really. Well first of all I say paint those walls, for the love of god, and paint them quickly. Even if you redo the color in a few months, change it from white tout de suite. Second, I say a shower curtain and bathmat could do wonders. Third, start scouting for cheap white subway tile (which can be found just about anywhere), which will make you feel like you're making progress on the project even if you haven't so much as wielded a sledgehammer yet. Good luck! De-lurking - just had to comment on this! Not sure if that would work well in such a high humidity area like the bathroom, but you may be able to seal it. We used the DIY tub cover spray stuff from Lowe's to refinish a tub. Did it look brand new and perfect? No. But it was much better than the horrid green olive gross color and it served it's purpose until we could replace the tub. For less than $30 and a day's worth of work, it was fine with me for a year. Otherwise I agree with everyone else - invest in some bright, lovely colors to make the beige less of a focal point and hide the majority of the ugly behind a shower curtain. Yeah, without gutting it and redoing the whole space I think a new shower curtain and maybe well planned towels is all you can do. Maybe lock the door and not open it until future remodel time? We too just spray-painted a shower with some fancy epoxy kit from Lowe's that was $50. It was several steps but I'd say with the situation you have, I'd take several steps and spend $50 to mitigate that disaster! hmm... i know you can re-glaze a porcelain tub but not 100% sure if it's the same process for a cast-iron. i think you can probably just paint it, and if it is in fact that easy - go ahead and do it! if you're going to need it re-glazed though, i'm pretty sure you need a professional for that. but make sure they do a thorough job. my parents had a tub re-glazed recently and the guy who did it left drip marks that dried that way and it looks terrible. You should check out Kim from Desire to Inspire's bathroom redo (http://www.desiretoinspire.net/blog/2010/4/13/kims-temporary-bathroom-re...). She mostly used some paint and some cheap stick-on flooring to make her bathroom look awesome. Add me to the people recommending accessories. They make a huge difference (including switching out the towel rack, etc.) And I think you've already learned what a difference paint makes. Depending on how ambitious you want to be, you can also paint the tile and grout. I've never re-glazed a bathtub, but I get the impression it's not really a DIY project. Thinking about colors that would go with the existing beige, aqua blue and chocolate brown are really in right now. You could do brown towels, rug, etc. and blue walls... just a thought. * Add a juicy, delicious bright, like teal, aqua, orange, red, grass green - something gorgeous (considering whatever color you choose as your neutral, of course - black & orange = Halloween, eeew). * Add a cute art print that ties in your bright color, and make sure the frame is your neutral color. That should really fix it up! You can paint both the tub and the grout yourself. Painting the grout white and a crisp white shower curtain would be a great start. You can buy tub painting kits at Lowe's as well. I have done it and it's not hard, but it is very fumey so make sure you're ventilated. And don't use harsh cleaning products after it's painted, either. I cast for home and garden TV shows for a living and I have seen MUCH worse! We had our nasty discolored cast iron tub and beige tile reglazed for less than $300. The difference was amazing. It looked brand new, but definitely don't try it yourself. Apparently, the fumes can be rather nasty so call in a pro. I don't know if anyone above said this, but what you want to look up is tub "re-enameling" or "resurfacing." I've had it done and it makes it look brand new and white, white, white. The fumes are kind of bad so you might want to stay somewhere else overnight, especially if there is any chance of someone harboring some sort of parasite that you wouldn't want exposed to toxic fumes. You know, just sayin'. I second the tile paint suggestion. My partner did it in a few hours- transformed a small 70's all turquoise bathroom (I know Holly would find this blasphemy to paint over turquoise!) into a clean white sparkling new bathroom. The cost was $190 and it looks amazing. New towels, a little decorating, and you're set! Woah - that is very beige. We had the same problem with our kitchen when we moved in to this place - very beige (and very shiny - yes, shiny beige) cupboards and floor. Couldn't really afford to re-do them, so we painted the walls a darkish teal and painted the chairs glossy red, which makes the beige a welcome touch of neutral in an otherwise bright room and turned the kitchen into our favourite room in the flat. Painting is easy and cheap! I'm a single male in his twenties, so my decorating involves photos of my roommates making funny faces on the wall across from the toilet. Also, a Glade air freshener. In vanilla. Just seconding--or, no, more like thirtying--the "don't refinish the tub yourself" thing. We did that on an old clawfoot tub, and guess what my bathtime hobby became? Why, obsessively picking off large strips of paint, of course. I mean, once a section is starting to flake, it must be peeled off, no? I don't actually recommend this, however. Oh wow- that is worse than I thought....I liked the other suggestions of getting some really cool, really bright accessories (can you accessorize the bathroom?) Bright rugs, towels, etc. In our first house, we had seafoam tile halfway up the wall and in the tub surround and yellow tile on the floor (with seafoam accents, of course). Painted the walls white, hung white shower curtain to hide tub surround, hung a large mirror to make us think the whole room was bigger and *painted* the floor with an oil-based paint. That was at least six years ago, and it has worn pretty well. Maybe that's an option for you. Definitely cheaper than ripping the floor out and could tide you over until the revamp. About the bathtub (and someone may have already mentioned this, I did not read all the comments) check out Bath Outfitters. They do have one in your area. As for the tile...being a bit of a HGTV fan...apparently you can paint over the tiles. I'd say check out your closest box store for help on that one. Good luck painting that tub if it's cast iron. Our house came with an indestructible yellow cast iron tub. We bought a fancy white epoxy covering kit and set out to refinish it. After leaving an orbital sander sitting on the surface for five minutes without a scratch, we realized we couldn't prime the surface so the epoxy wouldn't stick. We replaced almost everything else and hid our bright yellow tub behind a white waffle weave shower curtain. I don't have any brilliant home dec advice of my own.... BUT once moved into a rental house that had similarly beige tiles, fixtures etc.... and the dear people before me had painted the walls in various shades of sea blue and aqua. I never would have thought of it, but over time, we began to see the beige as sand.... and the surrounding turquoise felt very ocean like. We added some seashells and some white accessories.... voila, Greece! Obviously, imagination and a sense of humour are key to any home decorating make do scenarios. This article is really good and bath room is looking so clean and nice i like it thanks for share it. A little late with this comment but I just checked out your bathroom photo and we have the same bathroom (except my tile is off white)! Our best bathroom "reno" was a curved shower curtain rod. It makes the shower/tub feel much larger than it is, and doesn't take much time or money.